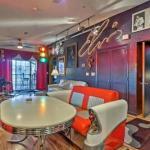 Situated 2.8 km from Branson and 4 km from the Missouri River King Condo at Holiday Hills offers hardwood floors Elvis-themed artwork and decor. Features include access to a golf course tennis courts and game room. An indoor and outdoor pool are available as well as a fitness centre business centre movie room and snack bar. Fishing is available on site. Guests can also buy souvenirs at the on-site gift shop. In addition to multiple balconies this lake-view 2-bedroom apartment has a full kitchen and with a microwave refrigerator coffee machine dishwasher and 6-person dining table. Other facilities at King Condo at Holiday Hills include a hot tub and sofa bed. A washing machine tumble dryer and ironing facilities are also offered in the unit. White Water is 19 minutes' drive from this property while Dixie Stampede is located 8 km away. Lake Taneycomo is within 11.5 km.